Internal and external bespoke doorsets. 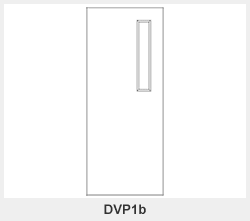 Flush doors in an extensive range of finishes, designs in standard and bespoke sizes, available as Non-fire rated, FD30, FD60 and FD120 doorsets. The benefits that having doors pre-hung in frames with relevant hardware morticing works carried out in the factory is increasingly seen as the obvious solution to the demands on contractors. This reduces the labour force required on site, the level of skill required to install, the management resources required to oversee and the installation time required on site. This all helps in projects where programmes are tight and excellence of carpentry works is borne by CNC machinery in the factory which take the onus of responsibility from site level to production level. Fire and acoustic integrity seals. 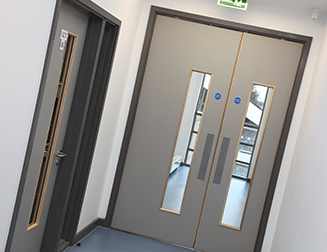 Doors can be delivered in their frames for simple quick installation or as often required, frames can be delivered ahead of doors so surrounding trades can continue, doors are delivered later and fixed into the prepared frames reducing the risk of damage to doors by arriving late on in the project. The balance of ironmongery where not installed to the doors is packed according to schedules in doorsets boxes , labelled and delivered to site for easy access and installation by the carpentry team. 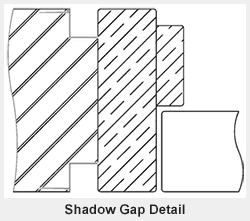 The core construction consists of three layers of cross banded lamels contributing to exceptional dimensional stability. 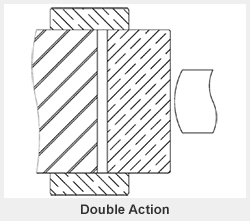 The core construction includes a concealed framing to all four edges with the top and bottom framing elements tongue and groove jointed to the core structure. The core material consists of a light weight fast growing tropical hardwood of approx. 300Kgs/m3 density. 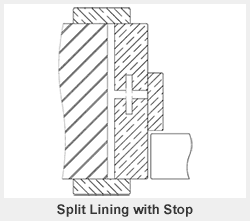 external use, subject to the application of suitable finishing systems. 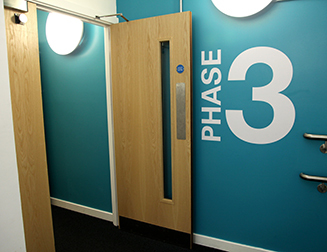 ‘Exposed’ –This option is often used where corners of doors maybe subjected to more impact and therefore chances of damage are reduced or where an alternative finish can be used to create a visual contrast. The timber for the core is harvested from forests that are managed to provide for forestation under the control of an ISO14001 Environmental Management System supported by chain of custody certification. 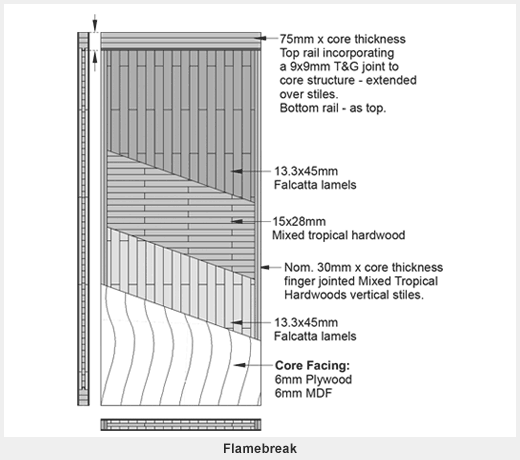 The core framing material is made up of mixed tropical hardwoods of approx. 480Kgs/m3 density. The framing is finger jointed to make economical use of timber from other processes that would otherwise be wasted. FSC® /PEFC. 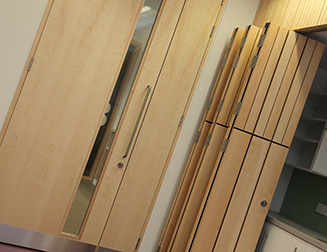 Dorplan is fully accredited to supply doorsets with FSC® (Forestry Stewardship Council) accreditation cover. PuraDor Doorsets are supplied with assembled frames. Doors can be factory hung into the frames or supplied separately. 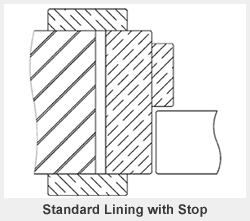 Standard: This comprises of linings, and separate stop. 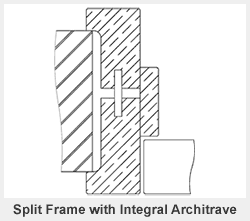 Split Frame: Primary frame with door hinged on with adjoining secondary frame and loose stop. Redwood: (Softwood) most commonly used material for paint finish applications, offering good fixing and ease of machining. Suitable for fire and acoustic doorsets. Hardwood: used where durability and security are paramount. For internal or external use. 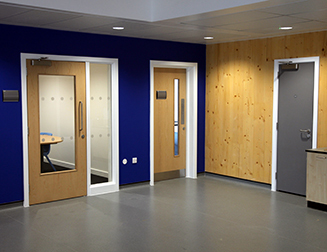 A wide variety of species is available and can be used to compliment the door finish using lacquering or staining processes. Suitable for fire and acoustic doorsets. 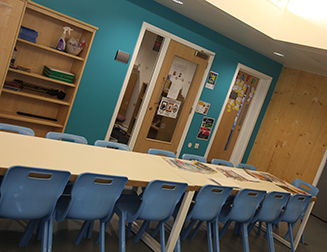 MDF: A low cost solution providing a smooth finish for final decoration. Suitable for fire rated doorsets. The passage of light permeating through a building is often important. Dorplan supply a wide range of custom made fire rated and acoustic screens. 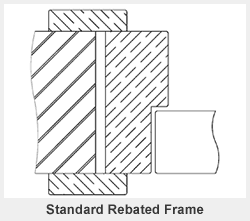 The finishes of screen frames are in either Redwood, Hardwood or MDF. There is a wide range of glass types and finishes available to compliment or support the requirements of any project. 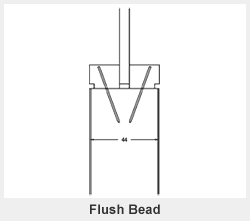 Glass is supplied loose with appropriate seals and beading. Screens can be supplied with integral blinds for privacy. Visibility through a door is a fundamental requirement in safety and functionality in certain locations. 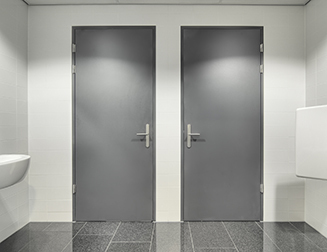 As doors are the principle barriers in this, the use of vision panels and side screens or borrowed overlights are widely used. Dorplan manufactures vision panels to any size within the scope of fire and acoustic test evidence. Vision panels with fire integrity up to 120 minutes or acoustic rated up to 52dB can be supplied using a variety of glass options which are fully tested and certified to the relevant standards. 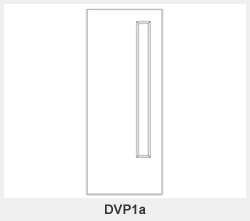 Privacy Glass - integral blinds and adjustable privacy vision panels, switchable glass. 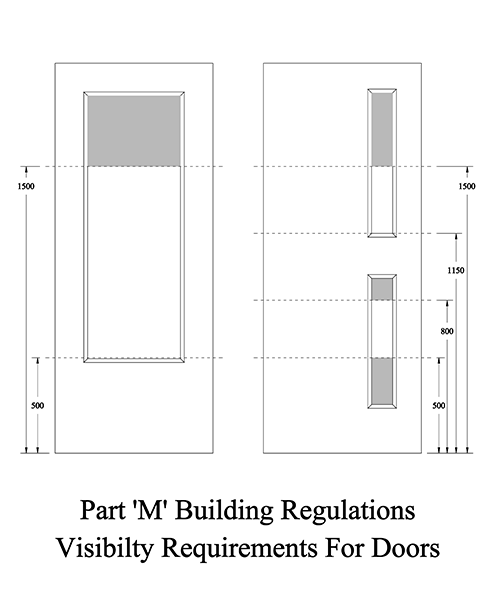 Part M Building Regulations for Effective clear width and visibility requirements. 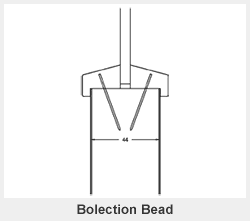 All timber beading is supplied in hardwood with species to compliment the door finish. Stainless Steel trims. Used extensively for enhanced durability and security and finishing effects. Dorplan’s ability to support clients in the coordination of finishes throughout the project is a much sought after service. Especially when tying in hardwood floors and furniture with the finishes on doorsets can be very challenging. With the perse range timber species and colouring effects available together with the colour blending staining service we offer, nearly all coordinating finishes can be achieved. Hardwoods are factory sprayed with clear satin lacquer but special sheen levels can be supplied where required from 5% dead matt to 90% high build gloss polyester lacquered. ‘Primed’ doors and frames are a legendary preference in the UK. 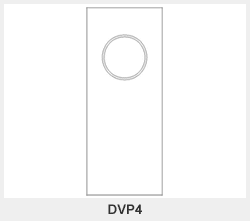 Site decoration for doors, frames and architraves is often viewed as the most practical and cost effective solution. Dorplan offer their doorsets in primed or Factory spray paint to any colour to your selected sheen level.